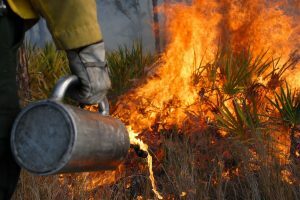 Prescribed fires are only conducted when weather conditions are safest. If fuels dry out, those conditions could become rarer. Photo by Yongqiang Liu, USFS. Weather quickly influences fuel moisture – especially for smaller fuels such as grasses. Grasses become waterlogged after short rains, and dry out just as quickly. Larger fuels, like logs and limbs, respond more slowly. The amount of moisture in fuel has major impacts on fire behavior, and a number of models have been developed to predict fuel moisture. Liu’s study also addresses the potential impacts of tomorrow’s climate, which in many parts of the world is expected to become warmer. If the climate warms as expected, fuels will become drier. Liu calculated the moisture content of small, fine fuels like grass as well as large, slow-burning logs and branches. The larger fuels are known as thousand-hour fuels and include logs that are between 3 and 8 inches in diameter. Smaller fuels such as grasses are called one-hour fuels, and are less than a quarter inch in diameter. In the U.S., one-hour fuels average about 8 percent moisture in summers, and 20 percent moisture in the winter. Thousand-hour fuels are usually a few percentage points moister. Most wildfires begin with small fuels, such as grasses. Wildfires could become larger and more severe in the future. Photo by Mike Meares, U.S. Air Force. Liu found that in the future, moisture content in one-hour fuels in the Southeast will probably decrease by more than 1 percent. The moisture content in thousand-hour fuels will probably decrease by more than 1.5 percent. Fuel moisture will continue to vary across the seasons. However, it is projected to decrease overwhelmingly. The decrease will vary across regions – Liu’s study suggests that the drying trend will be strongest in the southwestern U.S. and the Rocky Mountains. 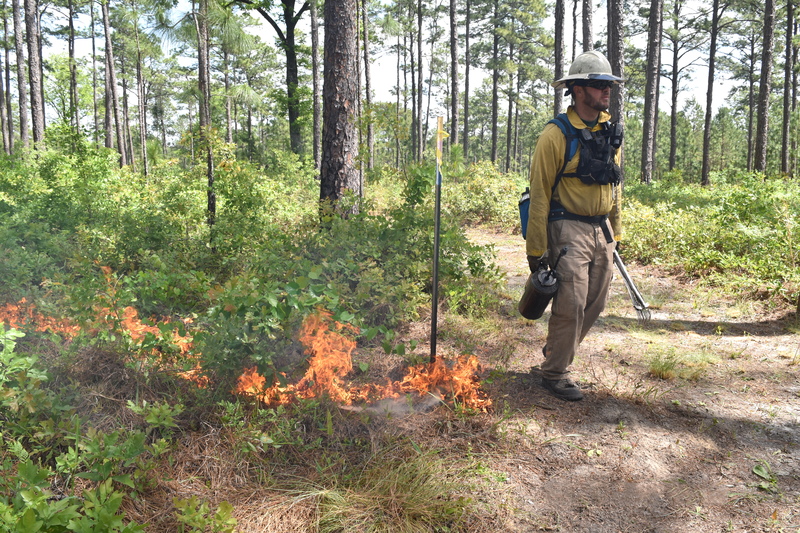 The Southeast has an extensive prescribed burning program. 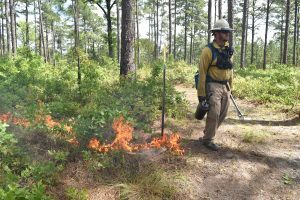 Because fuel moisture is typically highest in the winter, most prescribed fires are conducted then. In some parts of the Southeast, burn windows are not long enough for mangers to treat the number of acres with burning each year. Changes in climate could make the burn window even smaller. Along with changing fire behavior, drier fuels could have other effects. For example, the top layers of the soil are flammable under some conditions. One of the top layers, called the duff layer, helps keep water from evaporating. If the duff layer dries out, plants could become water stressed more often. For more information, email Yongqiang Liu at yliu@fs.fed.us.